Licaps CoQ10-tocotrienol synergy - the key to cardiovascular health ! This product combines the increasingly popular higher dose CoQ10 with an exceptional lipid base: EVNol™ complex, a palm oil extract and the richest dietary source of tocotrienols. Tocotrienols are natural antioxidants that are similar to vitamin E but 40-200 times' more active ! The only difference is that they have more unsaturated bonds allowing them to penetrate the cell membrane more easily. The functional consequences of this difference are significant: alpha tocotrienol has 40-60% more antioxidant activity than alpha tocopherol. The cholesterol-lowering, anti-thrombotic, anti-mutagenic and antioxidant effects of tocotrienols are well-documented. Two human studies showed that tocotrienol supplementation over 18-24 months reduced atheromatic plaques in carotid arteries. In vitro and animal studies showed tocotrienols to have an inhibitory action against certain carcinogens and a direct anti-mutagenic action. The result is a sophisticated supplement and synergistic combination that is particularly effective and biochemically ingenious. It is THE product for anyone who has suffered a cardiovascular problem or who is at higher risk and therefore needs increased protection. Other ingredients: soya oil, soya lecithin, beeswax, palm oil. 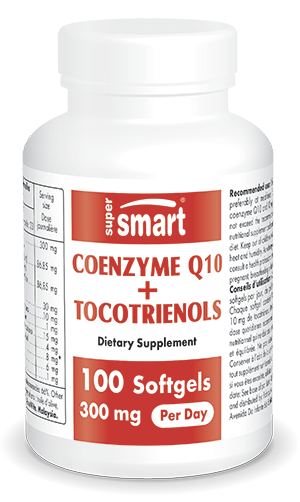 Each softgel provides 100 mg pharmaceutical grade coenzyme Q10 and 45 mg EVNol™ complex standardized to provide 50% tocotrienols. Take 2 or 3 softgels a day, at mealtimes, or more as advised. Warning: This product contains soya oil and soya lecithin.